Women’s roles in medicine have been gaining prominence for decades but the products they use have not kept pace. Considering gender in medical design will create better products with greater universal utility and appeal. Not long ago, female nurses in crisp white dresses and male doctors in lab coats typified the classic roles of men and women in medicine. But walk into any modern hospital today and you will find a drastically changed picture reflecting the growing diversity of our healthcare workers and their evolving roles. Despite significant cultural advances, however, medical tools and artifacts in use continue to reflect an inherent gender bias. This inconsistency—between who medical products are designed for and who is actually using them—offers opportunities to both address some residual problems in the medical community, as well as improve the efficacy of medical procedures. Contrary to popular belief, an oversize garment does not allow freedom of movement, and in fact may constrict movement or result in unnatural, compensating movements and body positions. While the percentage of women practicing general medicine has grown over the years, the female population remains low in healthcare specialties long dominated by men. 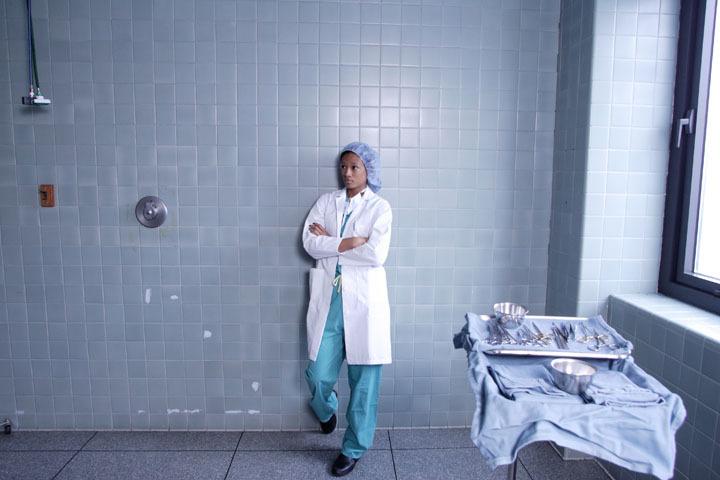 For example, surgical sub-specialties are still considered “boys’ clubs,” with women representing only 9% of orthopedic surgery and 10% of neurosurgery residents in 2001. The overall goal for good design in healthcare must be to improve performance, not hinder it. Significant improvement in surgical performance can be accomplished without a heavy investment in technology, but rather with a conscious, dedicated effort to understand the needs and perspectives of the increasingly wide range of product users. The male perspective has dominated the medical hierarchy for so long, and considering that medical products are predominately designed by men, there are considerable opportunities for innovation by capturing the female perspective that has been overlooked for years. What does Unisex mean anyway? 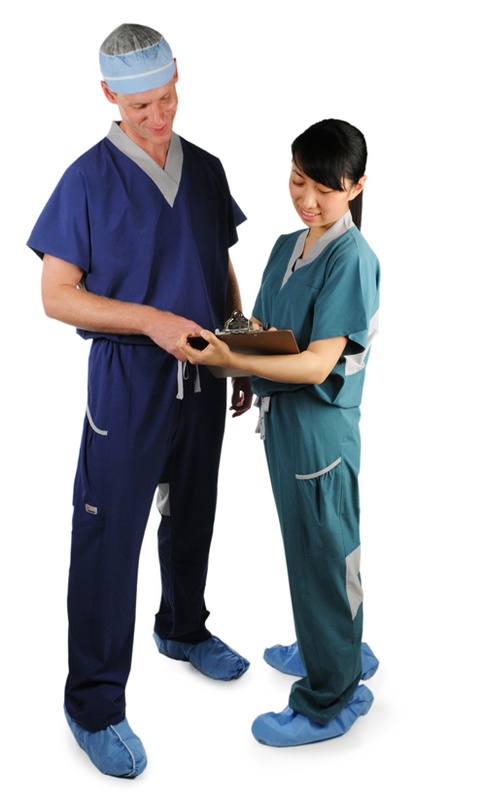 Exacerbating the apparel discomfort in operating rooms, the majority of hospitals only stock unisex scrubs. While worn by both genders, they are obviously designed for a male body. This would not be a problem if only surgeons used them, however men represent only 27% of the employees working in operating rooms after accounting for anesthesiologists, surgical nurses, and scrub technicians. Therefore, 73% of the staff’s needs are overlooked by hospital administrators. The concerns expressed by female hospital workers range from peek-a-boo exposure to difficult-to-walk-in inseam and rise lengths. These kinds of problems, inspired by an inherent gender bias and resulting in increased risk to the patient, are not limited to operating room apparel, but can be found in just about every product category in the health care arena. The tolerance level of female healthcare workers to “work-around” a product’s shortcomings is astounding, but not surprising. Historically many such problems have been accepted as part of the norm in a profession that wears endurance as a badge of honor. But as the level of competition intensifies in the medical community, there is an increasing opportunity to reconsider poorly designed products and improve the experience for healthcare workers and patients alike. Similarly, niche medical products are often highly engineered, but can lack an overall design that considers the way the product is used and who actually uses it. These niche products, ranging from the knife in a surgeon’s hand to the clothes she is wearing, can re-establish a new industry standard if designed with real users in mind. The redesign of existing products to serve the needs of an underserved market–or the design of new products harnessing new technologies to improve overall effectiveness–offers significant opportunities to bring thoughtful innovation to an industry stepped in tradition but struggling to maintain competitive advantage. Some exemplary products are already seeing great success in the medical world. Kavo Dental, a 100-year-old device manufacturer, identified a gender-bias in the dentist’s office similar to those in the operating room. The company recognized that the growing number of Asian female dentists meant that a higher percentage of their customer base could not handle the company’s large drills properly. In response, they redesigned their drills to fit smaller hands. Kavo Dental’s new, more inclusive drills have become a world-wide success and have set the industry standard. Curiously, and perhaps because user needs are rarely addressed in the design of medical products, some of the most user-friendly innovations come from outside the healthcare system. For example, Crocs have become standard equipment among medical professionals because they solved a problem for a larger customer base, and were therefore quickly adopted within the medical community facing similar problems. Health care workers who are frequently required to stand for long periods enjoy the long-term comfort provided by the single-piece foam shoes even though they were designed more for the beach than for the hospital. Nurses and physicians who wear masks and full-length gowns appreciate the ventilated slip-on shoes because the holes on the top help their feet stay cool. Crocs are not a gendered product, but they do not discriminate, so they have been widely adopted by both men and women in hospitals. As the roles of men and women shift in the medical profession, the longstanding gender-bias inherent in the tools of the trade becomes more visible. Medical professionals have the choice of either conforming to the standard protocol (which may increase their physical discomfort or introduce risk to the patient) or incorporate solutions from outside the medical establishment to their problems. For the medical industry, this presents an opportunity to either accommodate the other 75% of the user group (and create a new market for goods and services), or risk alienation by medical professionals…or even litigation by patients. Hopefully, the industry will choose design, which will improve the healthcare system for all.